As a student of military history it is easy to gloss over the personal impact that war reeks. Millions of people have willingly and unwillingly sacrificed their lives in the human experience that we call war, which unfortunately continues to this day. Reflecting on the grandeous ambitions of a war to end all wars (1914 – 1918) it is truly sad to see that what it really brought to the fore were more effective methods of killing more people. Resulting in tremendous waste of human life. Into this hellfire marched many Australia soldiers to serve for what they believed to be right. We can certainly fault that naivety given the hindsight of history, but we cannot fault their sacrifice and dedication to duty. 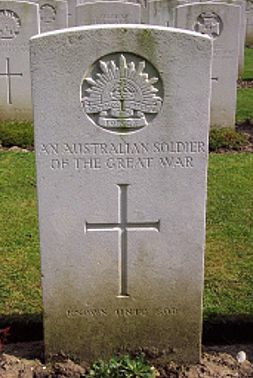 It is for this reason, on this date, the 11th day of the 11 month, we pause to remember theirs (and others) commitment and belief to the future which we now enjoy. We are a product of our past and soldiers like many of those from the First World War gave up their future for something they believed in. Being right or wrong is simply a judgement history makes, however at its core is an individual making a decision that, for many, cost them their lives for just such a belief. Today we should focus on the those that scarified in a way that many of us will never experience or hope to experience. Our legacy should be to leave the world a better place, to live up to the expectations of those who had their lives tragically cut short. If nothing else, take a moment and simply remember those that fought and died for causes they held true and hope that you are never put to such a test.